History appears to have been made in the USA as it appears that the son of a Kenyan (Barack Obama’s father was born in Kenya as a Luo) won the USA presidential race. WASHINGTON (Nov. 4) – Barack Obama was elected the nation’s first black president Tuesday night in a historic triumph that overcame racial barriers as old as America itself. For the first time, one who does not appear to have been a descendant of any of the tribes of Israel has been elected to become the President of the United States. Lest some make claims of racial prejudice here, I will simply state that I too, am primarily of Gentile heritage and agree with the apostles and the Bible that salvation is open to all of any ethnic background (Acts 10:34-38; 11:1; Romans 2:11-29; Revelation 7:9-10). Because Barack Obama’s father was Luo and his mother at least part American Indian, I believe that Barack Obama is predominantly Gentile and not Israelite. KISUMU, Kenya (AP) — Africans stayed up at all-night parties or woke before dawn Wednesday, gathering around televisions and radios as Barack Obama took the lead in his election bid to become the first black U.S. president. In Nairobi’s Kibera shantytown, one of the largest slums in Africa, hundreds gathered around a massive bonfire of burning tires. Residents joyfully held up Obama posters, blew whistles and waved American flags. KOGELO, Kenya (AP) — Barack Obama’s Kenyan family erupted in cheers Wednesday, singing “we are going to the White House,” as he became the first African-American elected president. In the western village of Kogelo, where the Democratic candidate’s late father was born, police had tightened security to prevent hordes of media and others from entering the rural homestead of Obama’s step-grandmother, Sarah. Now, I have searched the net (including amazon and Google print) and NOT been able to find the actual text (Visions of the Great Nyasaye) which is cited in the article above, hence it could all be made up. However, perhaps I should mention that on November 4, 2008, I once again went to the Obama campaign’s “Fight the Smears” website and there was still no comment about this alleged Kenyan “prophecy”–hence they have seen no real reason to deny it–which, of course, does not prove nor disprove it. Notable Luos: Raila Odinga ·Barack Obama · Peter A. Odhiambo (Luo (Kenya and Tanzania), Wikipedia. viewed 11/4/08). Hence, there apparently is a Luo religion in Kenya, and there was one associated with it named Johanwa Owalo who made some prophecies. And Barack Obama is considered, by Wikipedia at least, to be a Luo. While I believe that Barack Obama is basically a sincere and well-meaning individual, I also believe that since he is a son of a non-Israelite that he will likely help fulfill those prophecies, at least to a degree (and I also felt that John McCain would fulfill the last two biblical prophecies above if he was elected, see Monday’s post titled US Election Tomorrow: Pray & Fast). Allah’s Apostle said, “The hour will not be established till the sun rises from the West; and when it rises (from the West) and the people see it, they all will believe. And that is (the time) when no good will it do to a soul to believe then.” (Prophetic Commentary on the Koran. Bukhari, Volume 6, Book 60, Number 160.) Encyclopedia of the Orient. http://lexicorient.com/e.o/texts/bukhari/060.htm viewed 11/4/08). Why is it claimed that Barack Obama may fulfill that prophecy? Bill Keller claims that the above symbol represents the sun rising over the US flag, which he claims symbolizes the West. Essentially Bill Keller seems to indicate that the election of Barack Obama will be a sign for Muslims to refer to as proof that the time of the end is now upon them. While it is true that we are getting close to the end, how Muslims will feel about the son of a Kenyan becoming USA president, but who does not follow the Koran, is unclear to me at least (a follow-up news item of potentially related interest may be Obama in Islamic Prophecy?). 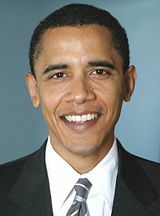 Presuming that he survives, President-elect Obama will lead a major nation that is in decline. And this will likely mean that Barack Obama will fulfill one or more biblical prophecies–and possibly non-biblical ones as well. We live in perilous times, but the Great Tribulation itself is not yet, nor can it begin before 2012 (and most likely 1-4 years later than that). And whether Barack Obama will be in charge at the final destruction of the USA is not yet clear, but it is currently a distinct possibility. This entry was posted on Tuesday, November 4th, 2008 at 8:22 pm	and is filed under Prophecy. Corruption reportedly up worldwide; Obama’s immoral views denounced in Kenya.